Promoting telemedicine to patients has never been easier with patient landing pages. Educate, promote, and drive video visit appointments all in one place with a dedicated patient web page custom to your practice. These pages are a great way to educate patients on how telemedicine works, the types of appointments that are applicable, and tips for their first video visit. We find that 90% of our top performing clients have the patient landing page linked from their site. After your custom page and URL is created, simply provide this to your web developer to have it live on your site. 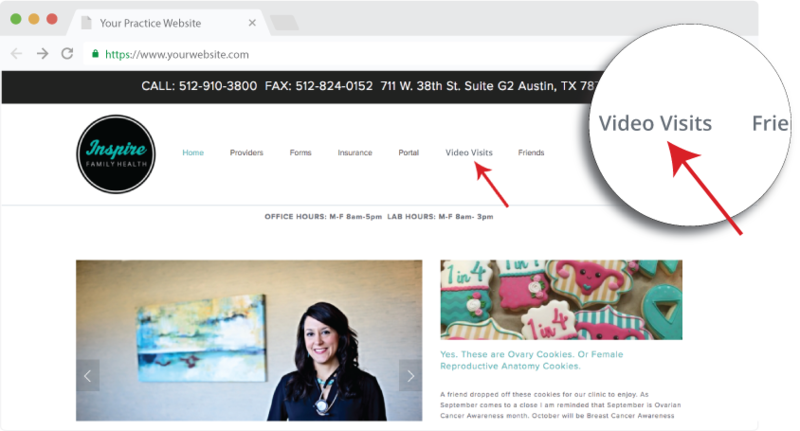 Add a "Video Visits" link to the main navigation bar of your website, get a $25 Amazon gift card. Add a "Schedule Video Visit" button and get a $50 gift card. Simply send a link to your website once it is implemented to support@chironhealth.com and we will send a gift card your way.